Producing and promoting music and events in Seattle. 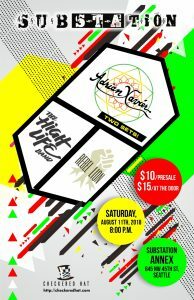 Join us Saturday, August 11th for a night of soulful higher consciousness reggae music featuring four sets of music by three musical powerhouses in the new Annex Room at Substation, Seattle’s premiere underground music venue, located at 645 NW 45th Street. Don’t miss out on this opportunity to see these three great acts! Presale tickets are only $10, available through Brown Paper Tickets.